Although not the main source of today's electrical energy, people would probably be more familiar with the term solar power (Solar PV) now compared to 20 years ago. In solar photovoltaic, light is converted to electricity directly using photovoltaic panels. This is one way, and the most conventional means of harnessing energy from the sun. The other method - not yet as popular but gaining momentum - is through Concentrated Solar Power (CSP). As it name suggests, similar to Solar PV, the the sun is the source of energy but harnessed indirectly. Parabolic mirrors are used to concentrate sunlight onto receivers and convert it to heat. This heat will be used by a steam turbine or a heat driving generator to generate electricity. 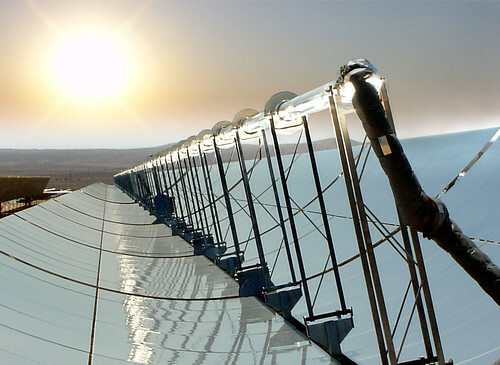 In CSP plants, long, parabolic silvered glass mirrors are arranged in troughs that track the sun as it moves through the day. The solar radiation hitting the mirrors focuses on metal heat-absorbing pipes, encased in glass, at the focal point of the mirrors, where it warms synthetic oil to temperatures of 350 - 400 degree Celcius. The super-heated oil is then pumped down the pipe to a central power block where heat exchangers absorb the energy to create steam that drives a steam turbine and generate electricity. In 2010, Solar PV has a total global capacity of 40,000MW with another 24,000MW expected in 2011. In comparison CSP total installed capacity in 2010 stands at 1,095MW while at least 6,200MW more has been initiated in 2011. This shows that Solar PV is way ahead of CSP in terms of global acceptance. Is it better than using the normal solar cells to convert the light to electricity directly? Unlikely. CSP is probably more of complementing Solar PV than a direct competitor. Due to the thermal storage capacity of the CSP system, electricity can still be generated during cloudy days unlike photovoltaic. It is good to diversify, especially if it is sustainable and one that does not harm mother nature. I like diversity. :) Newer buildings should incorporate more green technologies. I like the wind (what was the term, savonius?) + solar powered electrical generator integrated to building plans. thanks for visiting my blog and drop off a comments..
For buildings with BIPV (Building-integrated Photovoltaic), there are incentives provided by the government. @sahromnasrudin. Welcome & thanks for visiting.